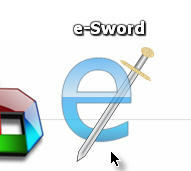 Couldn't find any decent icon for eSword, so I made my own! This being my first foray into the wonderful world of skinning, all tips are gladly appreciated, but I can't promise much in terms of upkeep. Thank you soooo much for making this icon. I have used e-Sword for many years and have found it the best bible study on the net. I appreciate the work and thought you put in making this icon. It looks nice in my dock. Thanks for sharing! Your icon is a nice addition, finally a good icon for my favorite Bible program.